When visitors walk into the new PNC Arts Annex in downtown Dayton, they will be greeted by an aerial sculpture created by Wright State University sculptor Landon Crowell. And if they stand in just the right place, they will be in for a surprise. 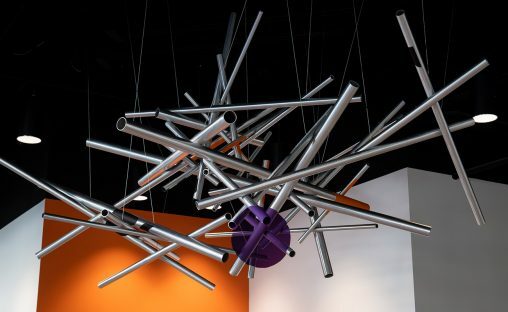 At first, the sculpture will seem like a chaotic constellation of aluminum pipes randomly speckled with paint. But as visitors walk into the visual “sweet spots,” the painted areas will come together to create what appears to be a floating colored disc — an optical illusion. In August, Crowell was commissioned by the Dayton Visual Arts Center to create the sculpture for the Victoria Theatre Association’s newest performance space — the PNC Arts Annex. The grand opening of the annex, located on the corner of Second and Ludlow streets, is Friday, Nov. 30. The 12,000-square-foot space, across from the Schuster Center for the Performing Arts, has been transformed into a blackbox theater, classrooms and workshop spaces to host performances for all ages. “They wanted something unexpected for visitors, and the selection committee liked that my sculpture would be mechanically static but visually dynamic,” said Crowell. Crowell said the aluminum pipes, which are fastened together with nuts that serve as rivets, are relatively light and were easy to work with. Crowell is an accomplished sculptor. The Dayton Visual Arts Center, one of the region’s leading contemporary gallery spaces and artists’ organizations, has called him one of eight promising Dayton artists to watch. Crowell has exhibited at the Rosewood Arts Centre in Kettering, among other arts venues in the area. His artwork is also featured at Corner Kitchen, a bistro in Dayton’s Oregon District, and matches the reclaimed wood and rough steel inside the eatery. As a fine arts technician at Wright State, Crowell is often called on to install art at the Stein Galleries in the Creative Arts Center. 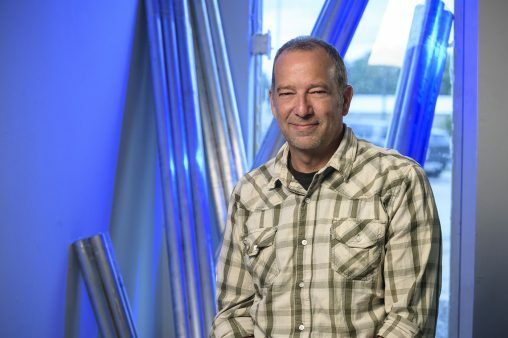 He also helped install “Dial,” the sculpture in the Neuroscience Engineering Collaboration Building that is designed to mimic the firing of the brain’s neurons by creating complex, shifting patterns of light and shadow. Crowell’s sculpture features an optical illusion for viewers who stand in a certain sweet spots. Crowell grew up in Dayton and became interested in drawing at Dayton Christian High School because his teacher said he had talent. After graduating, he pursued art classes in college. He received a full-ride track and cross country scholarship to the University of Akron but left before finishing his degree. During the summers, he worked as a mountain guide at Yosemite National Park in California. When Crowell was backpacking or working as a guide, a sketchpad was his constant companion. Letters home would be painted with watercolors. After leaving the University of Akron, Crowell returned to Dayton and got a job doing conservation work. He helped plant 60,000 saplings along the interstate highways between Dayton, Columbus and Cincinnati and cleared brush to create bike trails from Dayton to Brookville. Crowell later moved to Springfield, Vermont, where he worked at a production ceramics studio. He returned to Dayton and enrolled at Wright State, where in 2002 he received his Bachelor of Fine Arts in sculpture. After graduation, Crowell moved to Cimarron, New Mexico, where he taught high school art, photography, shop and welding and coached cross country. He joined the staff at Wright State in 2007.